The last image posted of the fires across Central Africa was on October 30, 2018. This image was taken almost a month later by the Terra satellite on November 27, 2018 and shows about the same amount of fire activity in basically the same areas. 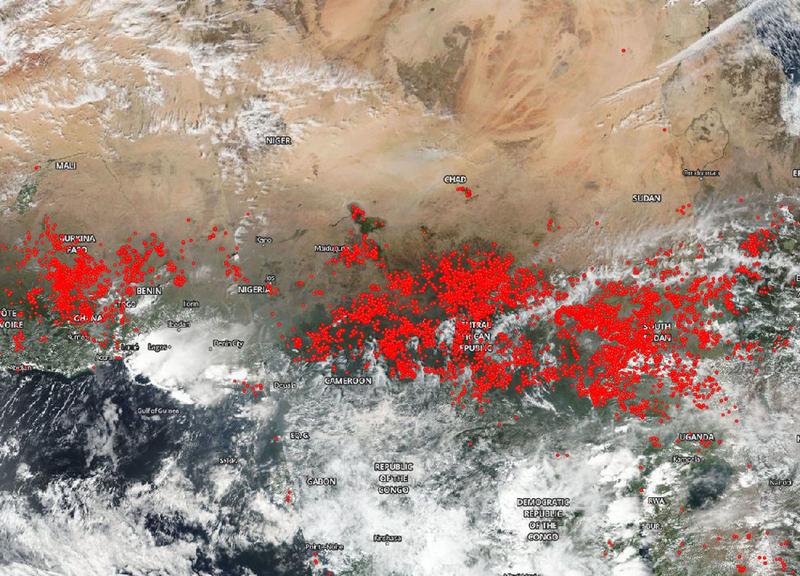 These fires, which continue throughout Central Africa's agricultural season, are most likely the product of human activity rather than just random wildfires. Farmers in this region of the world use the agricultural method of "slash and burn" to clear fields after the harvest. This method uses little technology and as such is a more economical method to clear fields. The resulting layer of ash provides the newly-cleared land with a nutrient-rich layer to help fertilize crops. While fire helps enhance crops and grasses for pasture, the fires also produce smoke that degrades air quality. Although these fires cannot be definitively proven to be agricultural in nature from a satellite image, it is the most logical explanation given the information present.